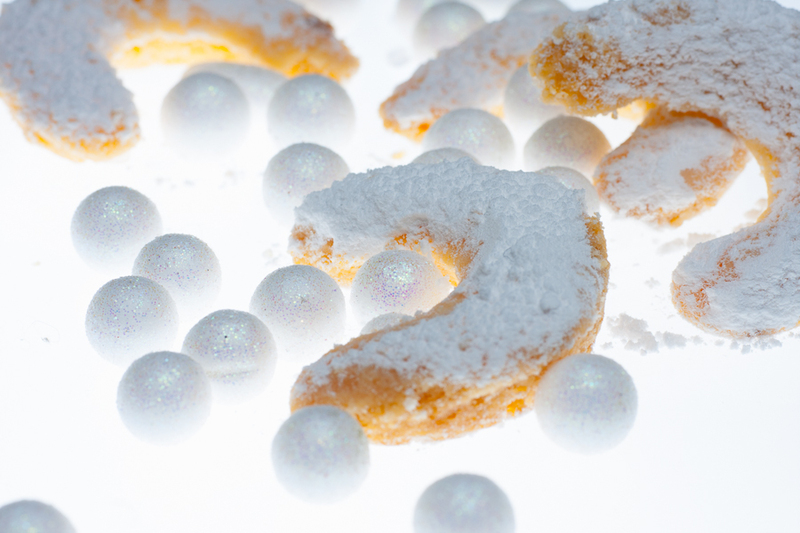 This vanilla crescent cookie just melts in your mouth and is my favourite Christmas cookie. 60 g. ground almonds In a large bowl, mix dry ingredients, flour, caster sugar, vanilla infused sugar, salt and ground almonds. 210 g softened butter Add the softened butter and mix well till dough holds together. Heat oven to 175 C.
50 g icing sugar for work surface Sprinkle work surface with the icing sugar. Roll out the dough, approximately 5 mm thick. 30 g softened butter to grease parchment paper With cookie cutter (about 3.5 cm in size) cut out cookies. Cover the baking sheet with the greased parchment paper and place cookies about 2 cm apart. 2 baking sheets are required for this quantity of cookie dough. Bake at 175 C for about 12 to 15 minutes. – cookies will be evenly golden. oven temperature 175°C / 12 to 15 min Remove from oven and cool on rack. While still hot, cookies will be very delicate and crumbly. Cookies keep well in cellophane bags or in a tin box.